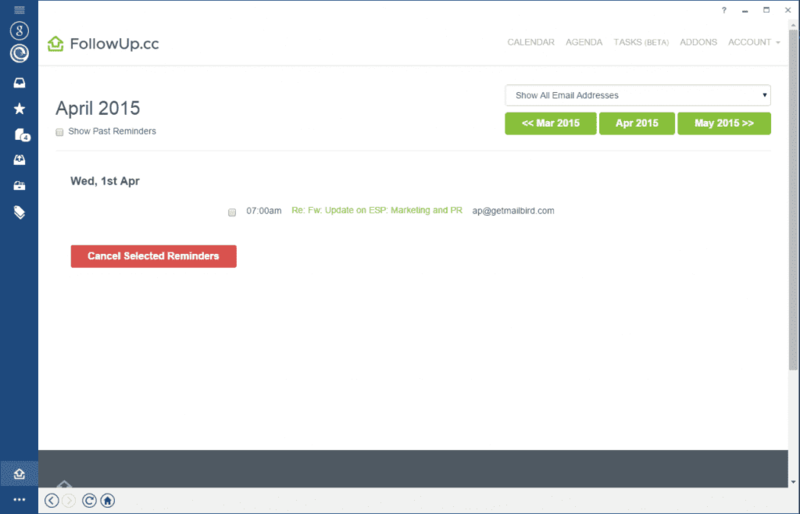 Another great partnership that came with Mailbird 2.0 is FollowUp.cc. Thanks to the great support of the FollowuUp.cc team, we were able to implement the awesome App, that will transform your Inbox into an organizer! 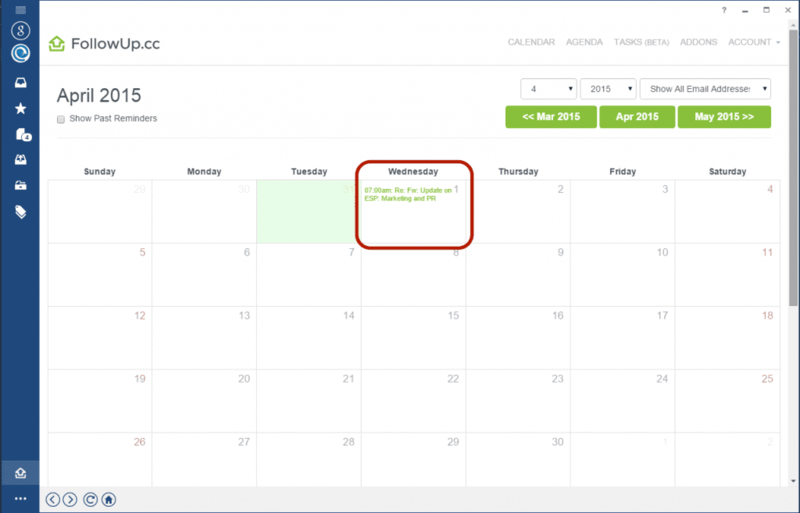 It lets you schedule automatic reminders so you will never forget an important email or task. Simply activate FollowUp.cc in your Mailbird App Store. It will then appear in the left menu panel. 1. 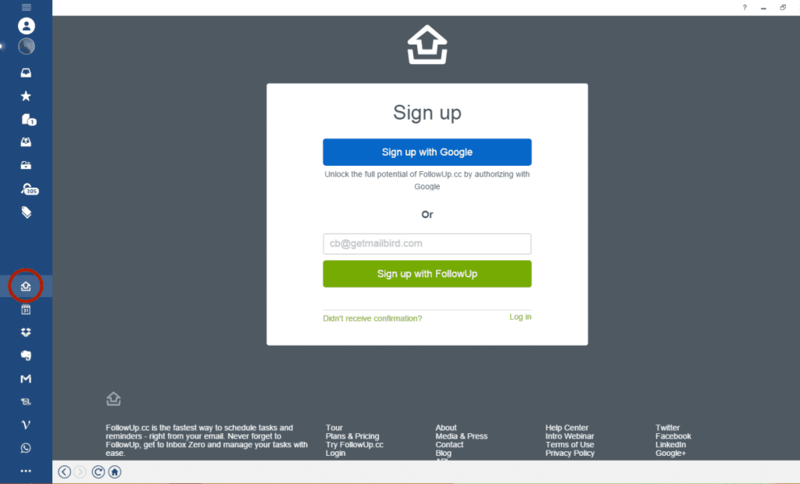 Click on the FollowUp.cc icon and sign in with your email or gmail account. 2. After signing in you are all set up to schedule your first reminder. 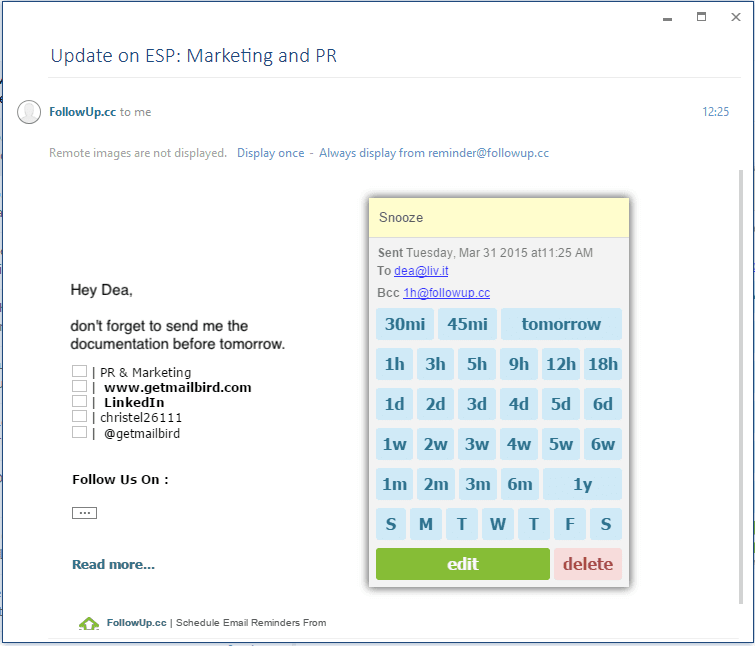 You will have a little calendar icon displayed on the bottom of every compose/reply/forward Window. 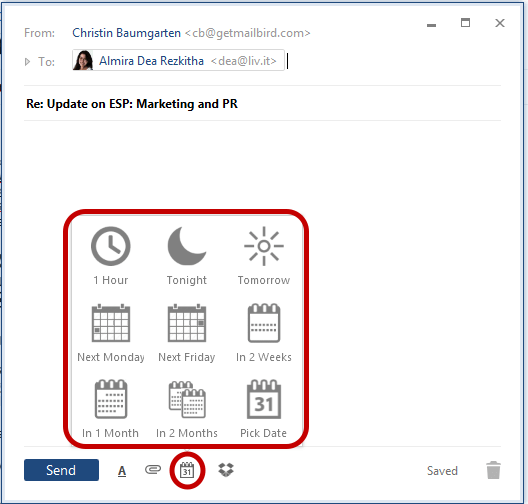 Click the icon to set the date you want to be reminded. 4. 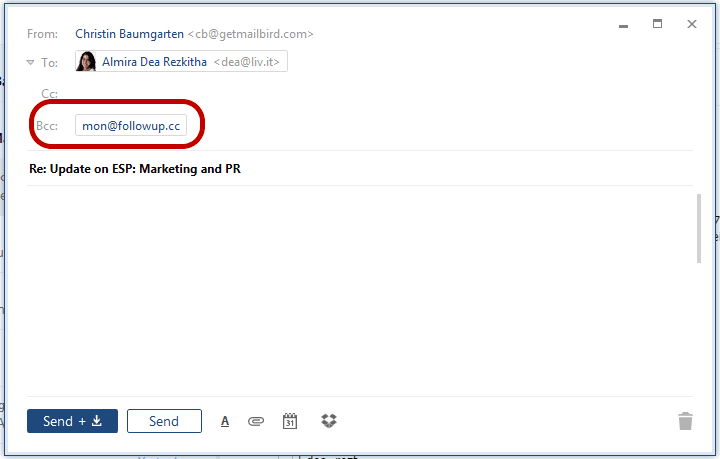 FollowUp.cc will automatically appear in the BCC field of your message. The email address will differ, depending on the date you picked. 5. After sending, you will receive a confirmation mail, listing the details of your reminder. You can easily disable them if you prefer not to get one. 6. The email reminder will appear as a regular email in your Inbox, giving you different options on what action you would like to do next. Reminder can be snoozed, rescheduled or simply be deleted or archived. 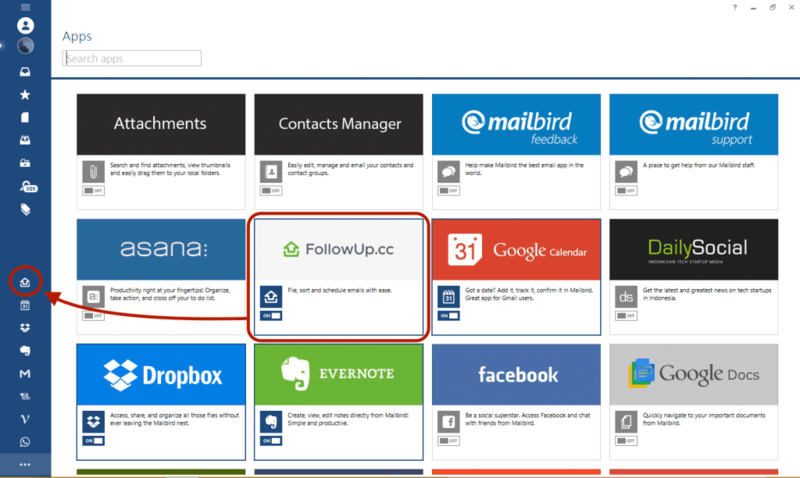 If you have signed up for one of FollowUp.cc subscription-plans, you can simply manage your reminder, by going to the FollowUp.cc icon on the left. The reminder will be listed in your FollowUp.cc calendar. From there you will be able to view and/or edit the reminder details, assign them to a task or simply delete them. Try it out and share this clever add-on with your friends today. Have you started using it already? Tell us what you think in the comments section below. 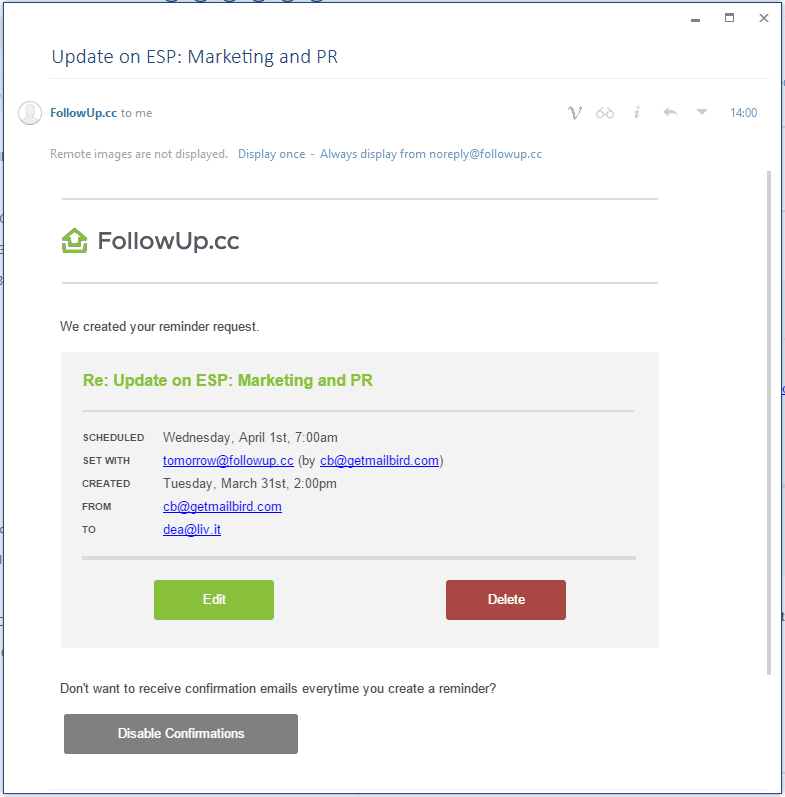 3 thoughts on "The Power of FollowUp.cc in Mailbird 2.0"
I was hoping to find an app that would trigger a reminder or send a follow up email only if there was “no reply”, like boomerang tries to do (poorly). Reminders are great, but I reply to so many emails that I don’t want to send a duplicate follow up. Hope this makes sense… Thanks in advance!